Most of the animals currently in our care were originally taken in by a kind woman who, while well-meaning, became overwhelmed and was unable to care for them properly. Many of the animals had been kept in a covered outdoor kennel for several years with no warm beds on which to sleep, no toys to occupy their minds and spirits and no kind words from a human friend. Amazingly, all of these dogs have come out of their ordeal with incredible spirit and they want nothing more than to please whomever shows them love. Unfortunately the future looks bleak for so many of these animals, but it doesnt have to remain so. Homeward Hounds Animal Rescue is dedicated to not only saving the lives of animals whose suffering has been so great, but to giving them a second chance at the happiness they so deserve. With the help of our dedicated volunteers, Homeward Hounds provides shelter, food, medical care and, most important, love to many needy animals. While the adoption fee helps to defray some of the cost of care, unfortunately it isnt enough. Because many of the dogs newly in our care have been severely neglected, much of the funds goes to desperately needed surgeries and other medical treatments, leaving little for necessities like food, blankets, toys and boarding for those dogs waiting to be placed in a foster home. Homeward Hounds Dog Sponsorship Program offers animal lovers a unique opportunity to help give these beautiful furry people a hopeful future! As a sponsor you will receive a photo of your sponsored dog along with a monthly update on his or her well-being, activities and adoption status (you will also be notified once a permanent home has been found). In addition, sponsors receive a subscription to Homeward Hounds quarterly newsletter,"Barkers Bazaar" which includes helpful articles on pet health and nutrition, information on available pet-related services throughout the world and humorous animal anecdotes! And finally, you will enjoy seeing your sponsored animal on Homeward Hounds web site with your name listed as his or her loving sponsor! Small business, corporate and school sponsorships are also available. Please ask for info. 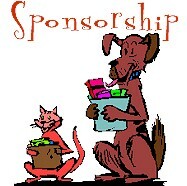 Sponsorship is a wonderful way for a family to make a special contribution to the world - together.